In the late 18th century the area surrounding the river – taking in the current site of The Varsity Hotel, and The River Bar Steakhouse Restaurant – was full of bridge land inns and pubs. With the arrival of the railway in 1845, many of these went out of business. A few factories survived the disastrous decline of the river trade, the largest being Finch’s iron foundry, on Bridge Street. The building now housing The Restaurant and Health Club & Spa was built in the late 18th century, as a bonded warehouse, part of the Anchor Brewery. During its restoration the original features were preserved, such as the magnificent King Post trussed roof. The painted walls were sand blasted to reveal the original Cambridge brick, and the large wooden beams that run through the building were uncovered. 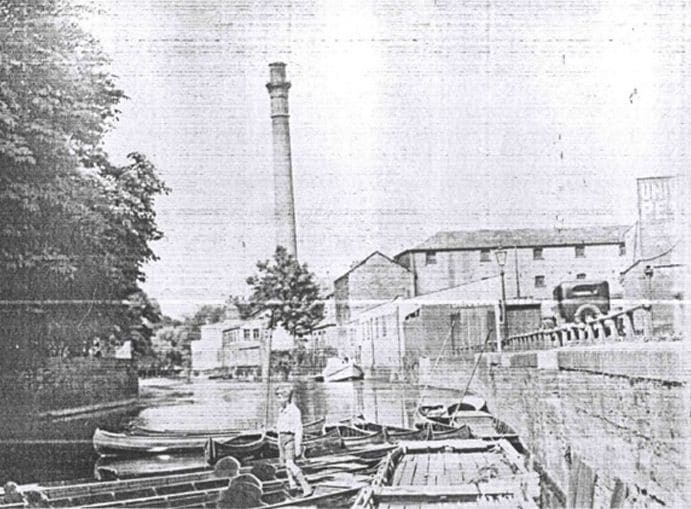 The Photograph taken in 1921 shows the Electricity Generating station built at this time, now demolished next to the bonded warehouse which contains The Restaurant on the river. It also shows punts on the river, with a punting station, which still currently exists.